Thunder at CAM. 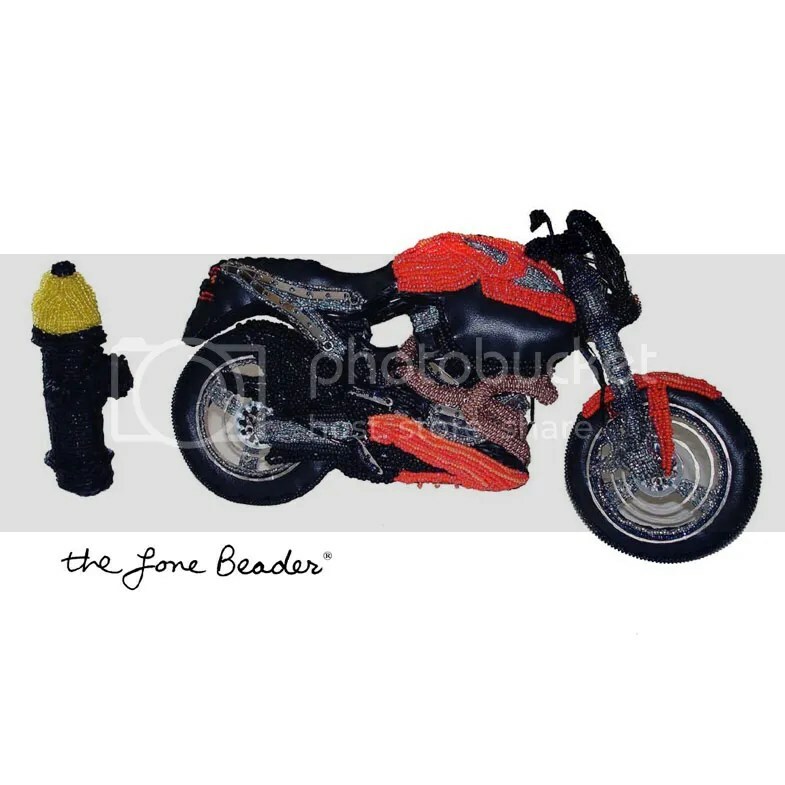 An Exhibition of Motorcycles & Motorcycle art. Coos Art Museum. If you live in the Pacific Northwest, I highly recommend taking a road trip to check out this exhibition! You can see a short video clip featuring some of the antique bikes at the show HERE. Also, check out the museum’s virtual gallery to view all accepted artworks & award winners! 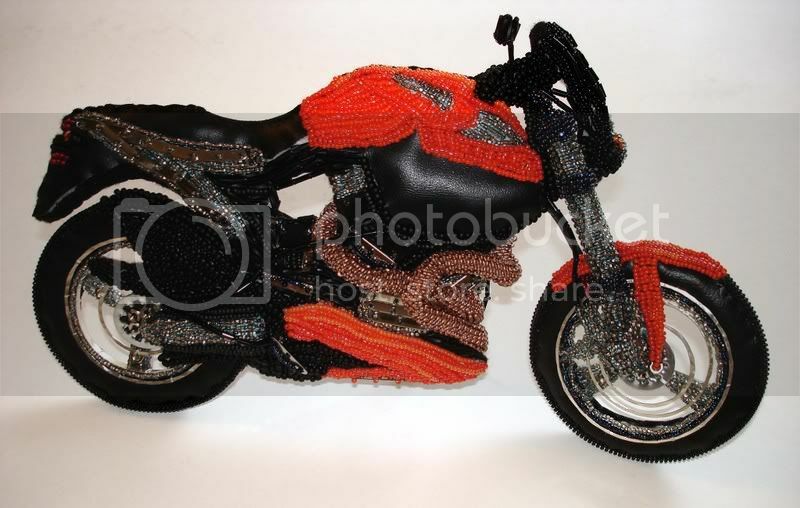 This week, I went to First Class Pack & Ship in Weymouth, MA to send my beaded motorcycle to Oregon! 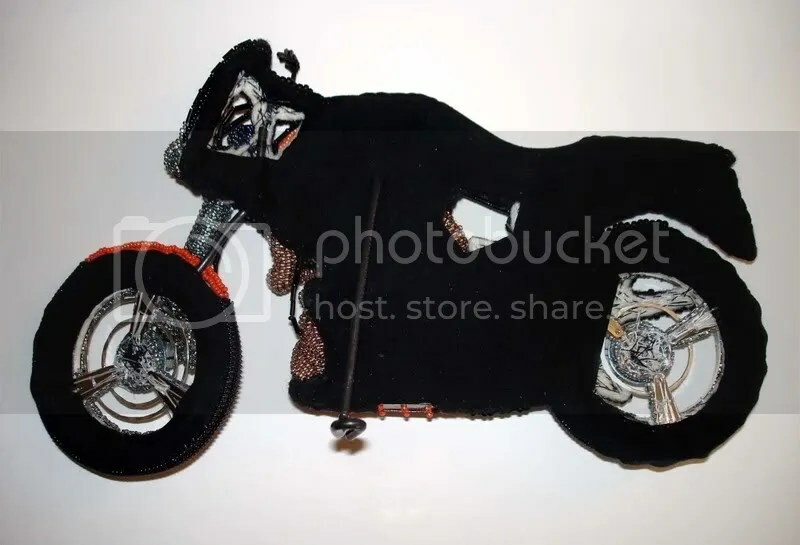 My beaded Buell X-1 Lightning entitled Free Parking Spot was juried into a large exhibition of motorcycles and motorcycle art at Coos Art Museum in Coos Bay, OR. 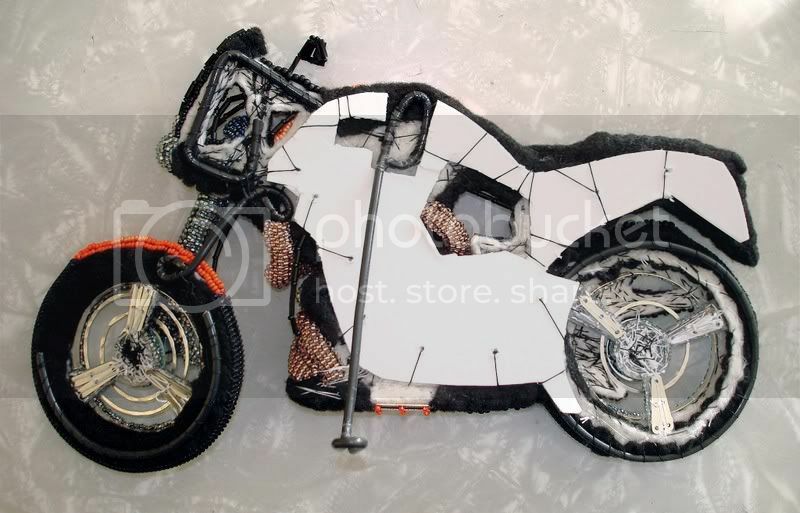 An exhibition of motorcycles and motorcycle art! EXHIBITION DATES: June 10, 2011 – July 23, 2011. MUSEUM HOURS: Tuesday- Friday, 10am- 4pm, Saturday 1pm-4pm. Closed: Sunday & Monday holidays. Coos Bay is located at 235 Anderson Avenue, just 1.5 blocks west of US Hwy 101, in downtown Coos Bay. Coos Bay is located on the southern Oregon Coast, along US Hwy 101. It is a 4-hr. drive south/ southwest of Portland, OR; a 2-hr. drive south/southwest of Eugene, OR; & a 9-hr. drive due north of San Francisco, CA. 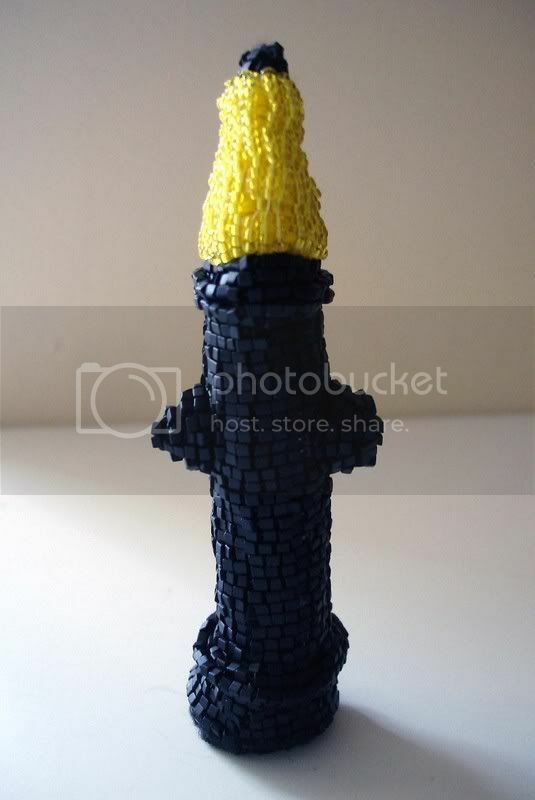 3D beaded Boston fire hydrant. 4″ x 1.75″w (10cm x 4cm). Afterall, there’s no where else to park in the city of Boston! 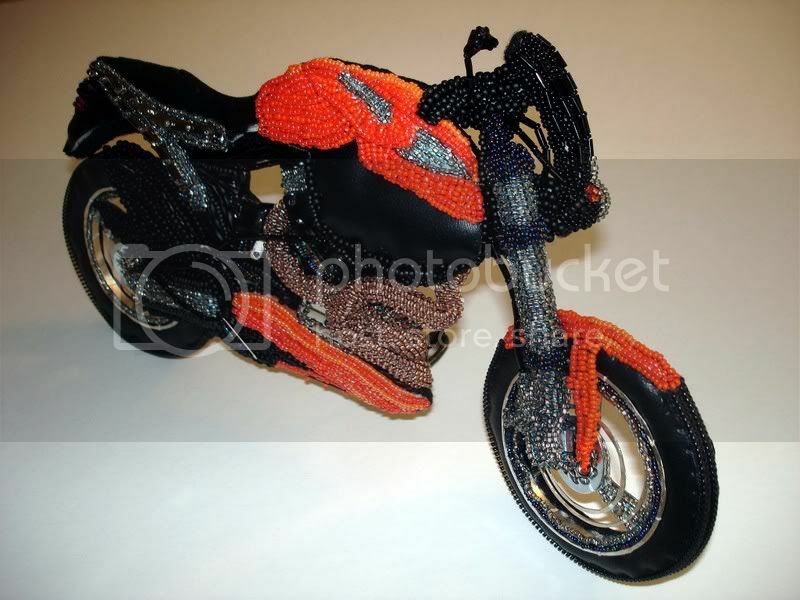 Today, I am proud to say that I am finally finished adding a backing to my beaded motorcycle! 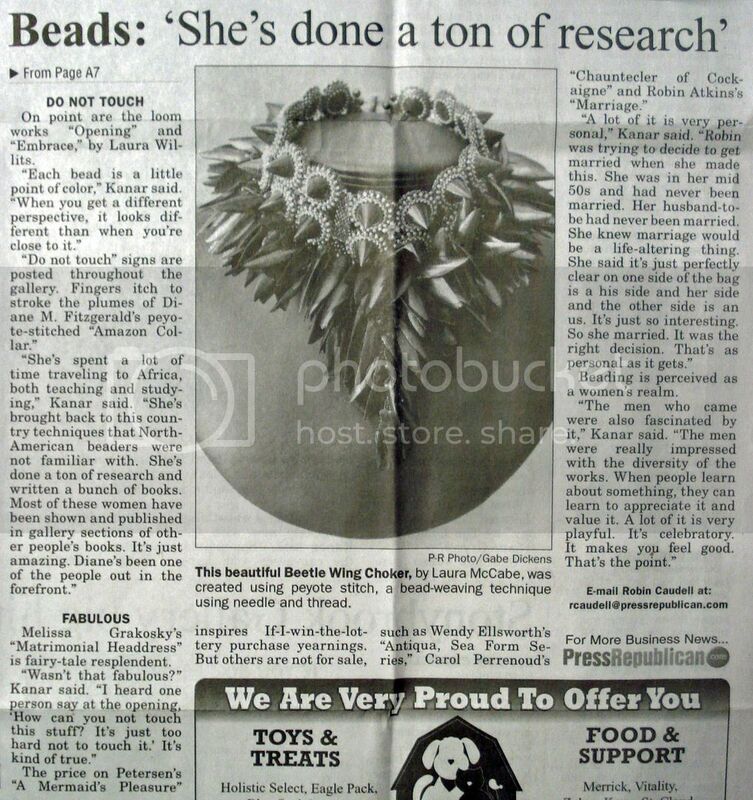 This project wasn’t easy either. 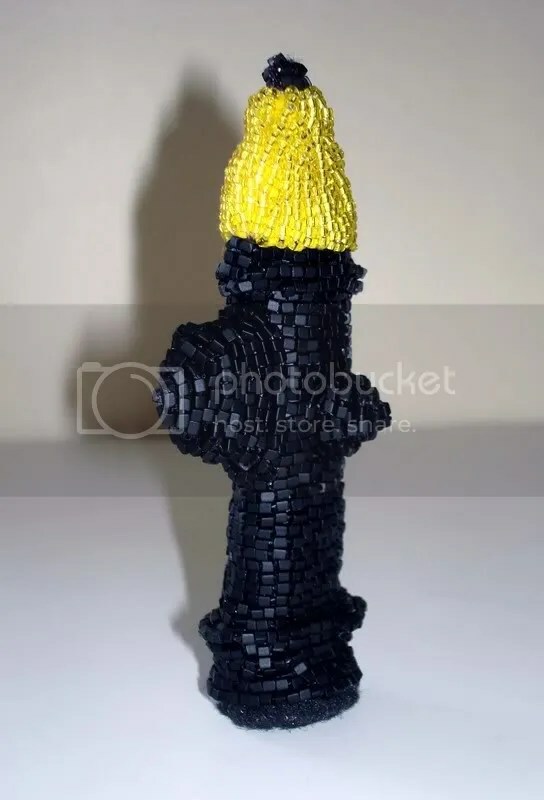 It took me 3 days to complete! 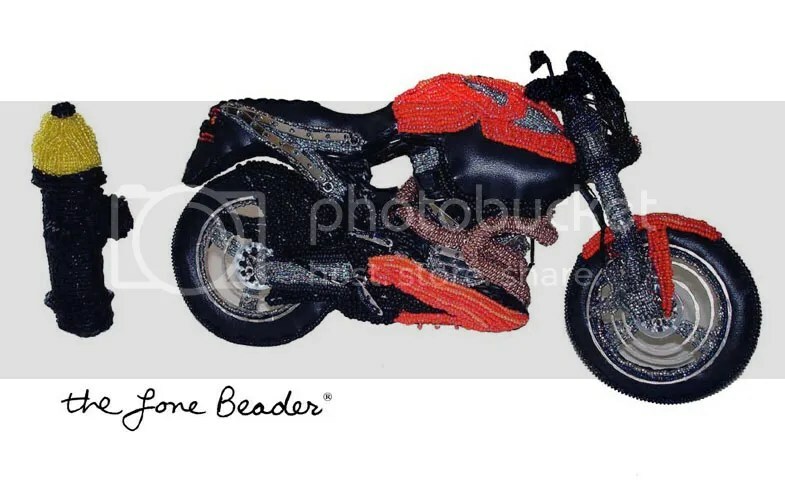 First, I had to find a strong wire that would support my beaded Buell. I ended up getting some 12g coated copper wire at the Home Depot down the street. 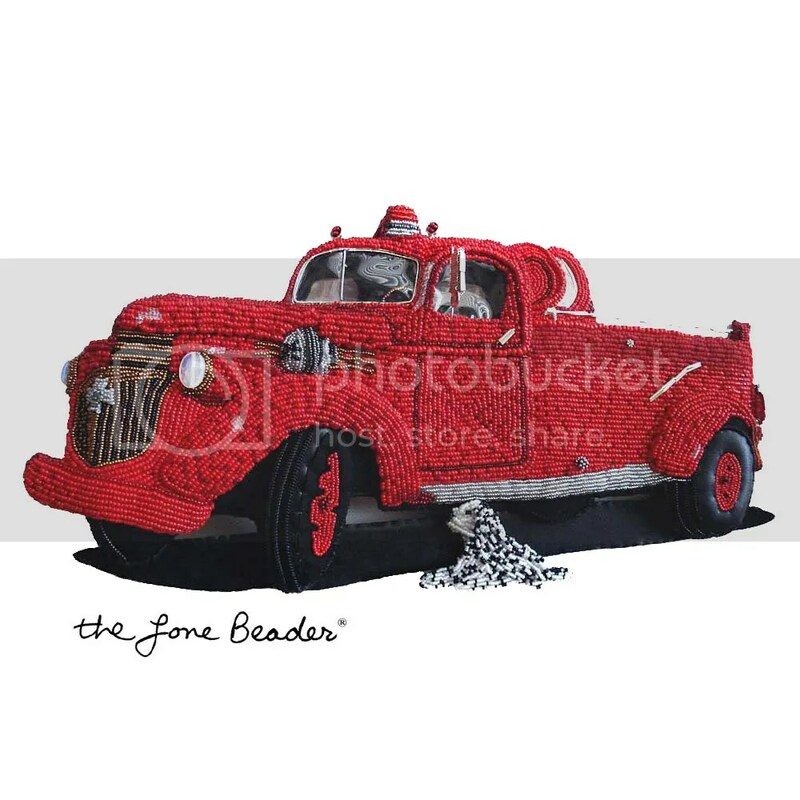 It is sturdy & heavy and it requires some serious wire cutters! 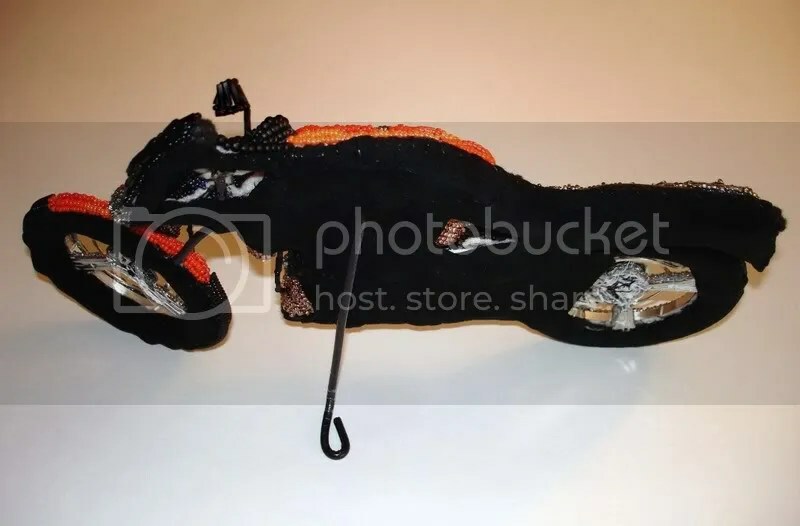 I cut a few pieces, and stitched them into place using needle and strong nylon thread. Then, I cut out some acid-free matte board and stitched that onto the back as well. Now, the piece feels quite substantial. 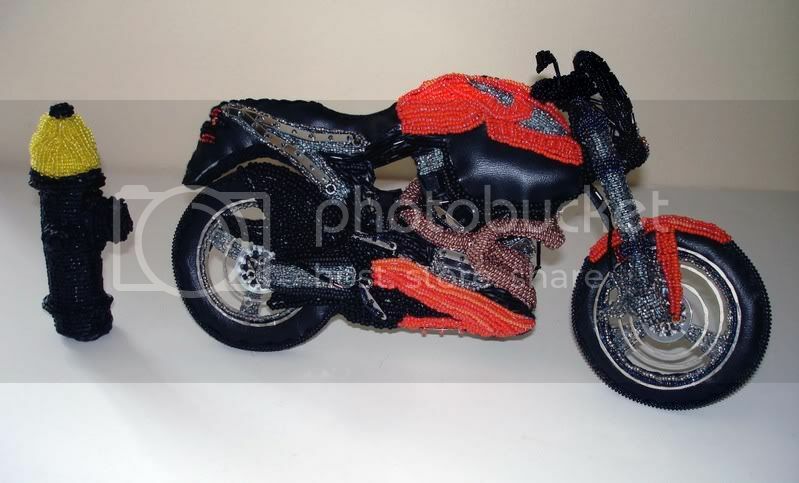 Beaded Buell X1 Lightning motorcycle. 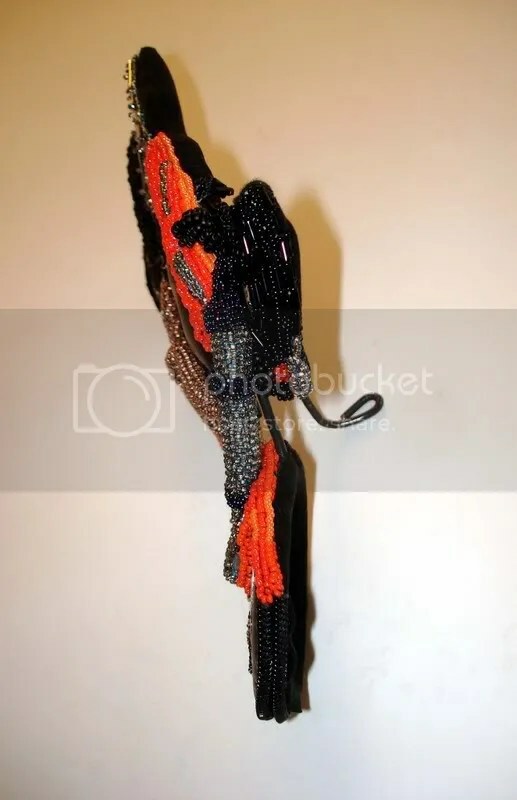 Glass seed beads, sterling silver, metal hardware, vinyl. 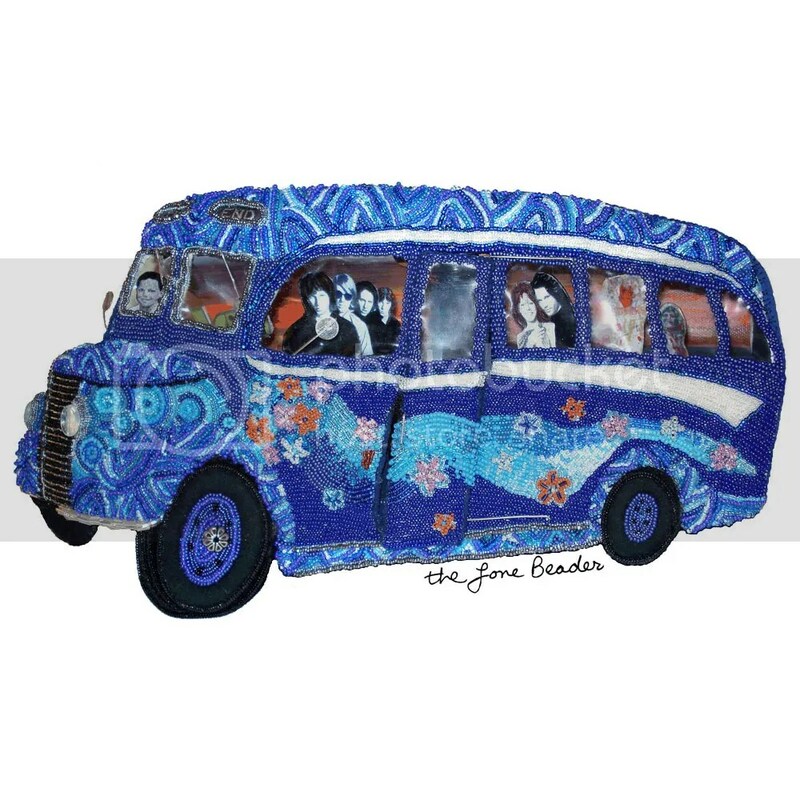 10″wide x 6″. 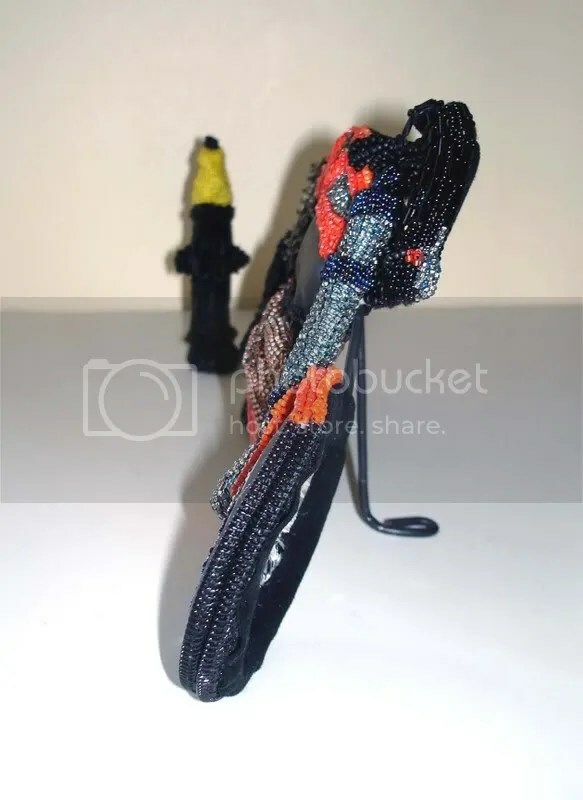 (25cm x 15cm) Click to enlarge. 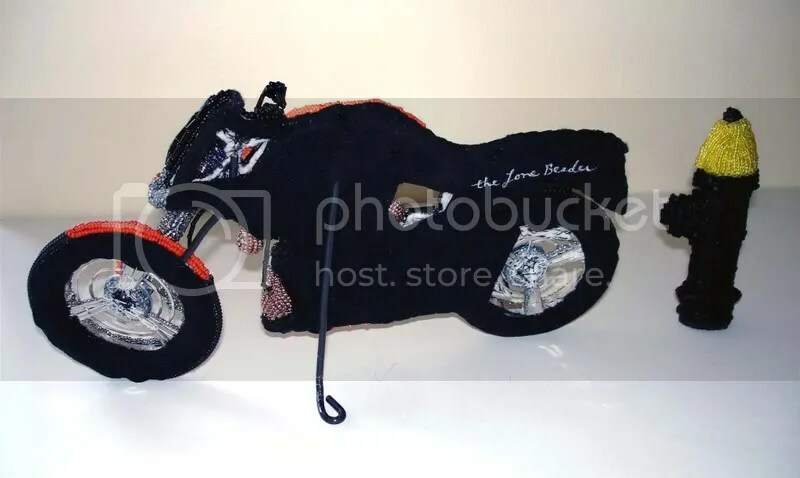 I wanted to be completely finished with my beaded motorcycle by now, but no such luck. Apparently my mind works faster than I do. 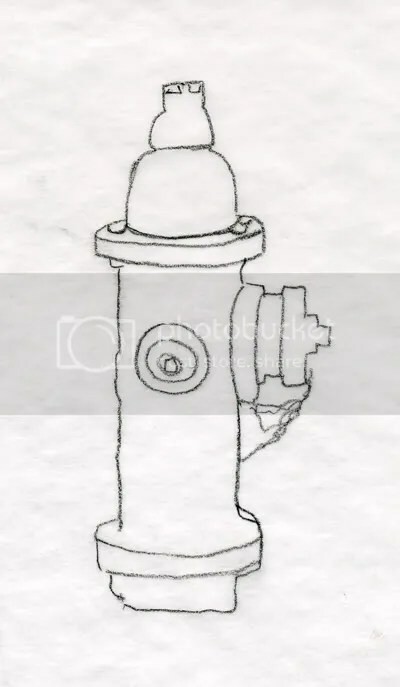 While I continue working on that, I thought I’d show you a sneak peek at what will be the second part of my current project – a Boston fire hydrant!